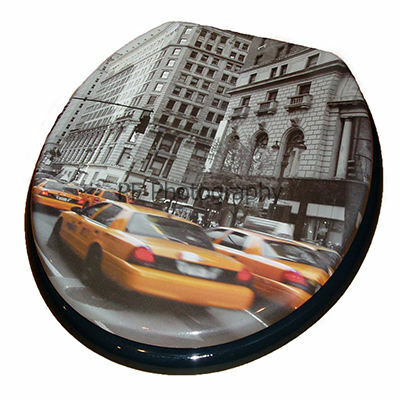 Moulded wood Toilet Seat with New York Taxi cab print design. With chrome plated hinges. All Wirquin moulded wood Toilet Seats offer excellent long lasting quality and innovative, contemporary designs. The hard wearing, easy to clean surface is naturally anti-bacterial and is guaranteed for 20,000 operations. The seat features attractive chrome plated hinges. This highly versatile seat is ideal for new builds and private properties and should fit most new and existing toilet pans. Please see seat sizes below for more information. Fittings are included.